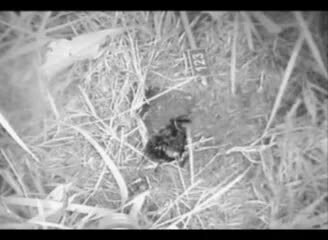 Tracing the success of individual wild insects in leaving descendants is now possible according to new research by University of Exeter biologists using a combination of digital video technology, tagging and DNA fingerprinting. Published on Friday 4 June, in Science, the study compares the behaviour and ancestry of field crickets in their natural environment, allowing the researchers unprecedented insights into what insects actually get up to. Also to answer questions about what behaviours increase the number of offspring an individual has; something that has only been examined previously in the laboratory. 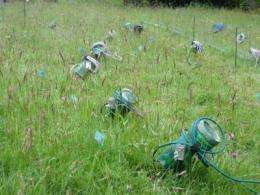 Infra-red CCTV cameras running day and night were focused on 152 crickets in a field in Asturias, northern Spain, home to the field cricket Gryllus campestris. 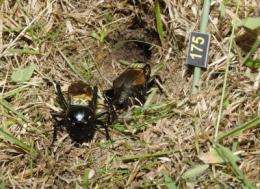 This ecological equivalent of the Big Brother house had 96 cameras and microphones triggered by any movement or sound the cricket makes around its burrow during the breeding season. Over the summer an entire generation of crickets played out their lives: reality TV in the raw. Unbroadcastable goings-on have been captured and prevailing wisdom over-turned according to the Natural Environment Funding Council (NERC) and Leverhulme Trust funded project. Males don't just sing to attract females they actually set off on mating safaris. Once they get together, pairs will mate not just once but up to 40 times, but females also nip out for quick liaisons with neighbouring males before returning to their regular partners. Crickets are known for their song during the summer months, males sing to attract and mate with females, who afterwards inject their eggs deep into the safety of the soil. There are battles to secure burrows and a constant need to avoid predators. By the following summer, surviving females will have laid hundreds of eggs each, but many leave no descendants and even the most successful have only a handful of offspring that survive to maturity. For males the situation is even more extreme with most leaving no heirs and a few having many. Super-glued to the back of every cricket was a minute numbered placard, just big enough for the camera to read. Additionally, a tiny piece of tissue less than a mm across was taken and used to create a DNA fingerprint of each individual. The visible tags allowed the researchers to analyse their lives and behaviours including mating partners, how long particular males and females spent together, the time that each male spent singing to attract females and the fights that occur when a male approaches a burrow occupied by another male. The team of biologists from the University of Exeter combined over 250,000 hours of intimate video observations with their DNA fingerprints to determine how many offspring each individual left in the next generation. The study demonstrates that the power of attraction and the ability to produce the most offspring does not always go hand-in-hand. Dominant males actually had fewer mates than males that lost more fights, but they left just as many offspring. Males that sang for longer had more mates, but this was only really important for small males - smaller crickets had to sing to have offspring, but bigger ones did better even if they didn't sing. Most intriguingly both males and females had more offspring when they had more mating partners. Something you'd expect for males, but which is less easy to understand in females. Dr Rolando Rodriguez-Munoz a postdoctoral researcher at the University of Exeter said: "Male crickets who sing more tend to be stronger and healthier, so they may be able to produce strong and healthy offspring, explaining why females prefer them. However, song doesn't seem to matter much to the success of bigger and longer lived males, perhaps because females don't worry about what a male sounds like if he looks good in other ways. It seems to be a combination of traits that show how good a male needs to be in order to attract a mate and to ensure his reproductive success." He explained, "It's easy to understand why males mate a lot because every mate means potentially more offspring. For females, things are different, they have to produce eggs, and another collection of sperm may be adding to an already ample supply. However, in our crickets, it seems that females that mate with more males leave more descendants, suggesting that promiscuity can be a good thing for females too"
He added, "We urgently need to know how ecosystems like this meadow will respond to a changing climate. Will evolution allow existing populations to simply adapt? Or will they be replaced by completely new assemblages? These are tough questions and we need to directly observe how behaviour affects reproductive success. And we're seeing a lot of wild behaviour that has never been seen on TV before!"